Here was my note to the governor. Submit yours here. After the issuance of EO62 on 9/1/2010 right at the beginning of Dove season and the ensuing uproar regarding the ban on firearms off of one’s own property that is spelled out in Article 36A, Chapter 14, all subsequent EOs issued by your office until this this one have specifically stated that they were only being issued under Article 1 of Chapter 166A. Your comments following the issuance of EO62 indicated that you were not invoking the firearms ban provisions of the law (presumable due to the court case, Bateman vs. Perdue). I question your authority to invoke Article 36A of Chapter 14 in an a-la-carte fashion. 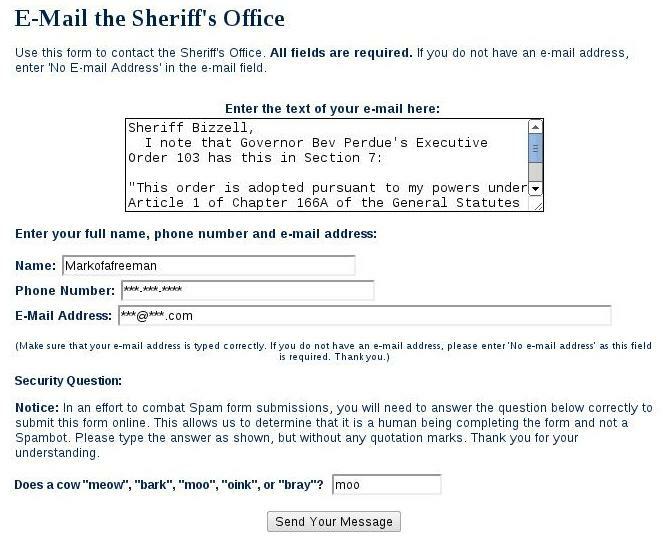 You have put the Sheriffs’ Offices in the 39 counties listed in EO103 in a rather difficult legal position. Do they enforce the law as written? Or do they do as the governor says? This morning, I spoke with Johnston County Chief Deputy Bengie Gaddis and he indicated that his office will not be going after those exercising their right to keep and bear arms during this State of Emergency. But the question this raises is, why is a Sheriff’s office choosing to selective enforce the law as written? I implore you to terminate this Executive Order immediately and re-issue it invoking only Article 1 of Chapter 166A. You could also re-issue without the exclusion of the firearms ban, as well, which would at least provide clarity to the Sheriffs’ Offices in those 39 counties. I believe those are the only legally sound actions you can take regarding the matter. If you live in Johnston County, NC go here and send your inquiry. If you live in any of the other 38 counties (Beaufort, Bertie, Bladen, Brunswick, Camden, Carteret, Chowan, Columbus, Craven, Cumberland, Currituck, Dare, Duplin, Edgecombe, Gates, Greene, Halifax, Harnett, Hertford, Hyde, Johnston, Jones, Lenoir, Martin, Nash, New Hanover, Northampton, Onslow, Pamlico, Pasquotank, Pender, Perquimans, Pitt, Robeson, Sampson, Tyrrell, Washington, Wayne, Wilson) where the state of emergency has been declared, then find your Sheriff’s office contact information and ask them, in your own words, what their policy will be. Unfortunately, there are many who are of the opinion that the Governor has no legal authority to invoke Article 36A of Chapter 14 in an a-la-carte fashion. She can invoke Article 1 of Chapter 166A, which has done with some previous Executive Orders if she so chooses, and I note she has in the past. I typically go armed everywhere I can, as it is within my rights, and often carry openly. I carry openly when I shop for groceries. I plan to do so tonight to be sure I’m well supplied for Hurricane Irene. 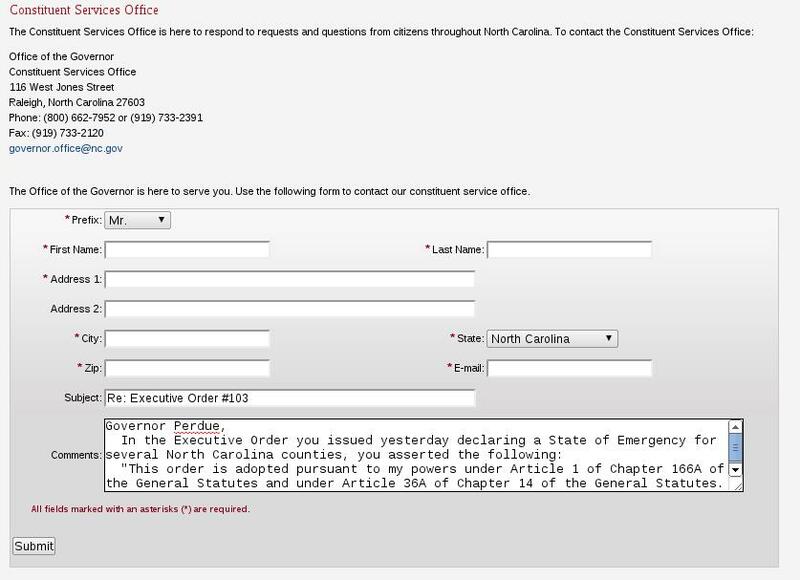 Could you please clarify for me how your deputies will be informed regarding encounters with legally armed citizens during this state of emergency that on the one hand makes it illegal to possess arms off of our own property, but on the other hand, the Governor has unilaterally modified a codified statute declaring that she is not invoking the prohibition on firearms portion of it? h/t to John for the info on the Executive Order. Update: Although I am appreciative that I got a fairly quick call back from Chief Deputy Bengie Gaddis regarding this matter, assuring me that the Sheriff’s office has got much more important things to do than go around looking for people carrying guns and that they pride themselves on respecting citizens right to keep and bear arms, it does raise an important question. And that is, why is the Sheriff’s Department choosing to selectively enforce the law? Admittedly, this is the fault of the governor for putting Sheriffs’ Departments in the above 39 counties in this position. Hence, my next action: contacting the governor’s office. If you live in Johnston County, NC go here and send your inquiry. Once there is someone who actually understands individual liberty in the White House, and enough willing critters in the Senate, I propose lobbying for a new head of the ATF: Alan Gura. In the nearly three years since I started this blog (though I’ll forgive my three readers if they think I forgot I had a blog), this is probably my first non-political post. I recently bought an official Gunwalker T-shirt from Sean and just happened to receive it right before participating in the monthly Vintage Rifle Match hosted by Crosse Creek Rifle and Pistol Club. I figured I’d wear the shirt to the match and told Sean so in email and we then exchanged a few messages about the match. This is essentially one of those messages, edited and expanded. The VMR match that Crosse Creek hosts is every fourth Saturday, come rain or shine, cold or heat. Though we don’t get subzero temperatures here in North Carolina, it can get a bit nippy for shooting. On the heat side, the summer months it can get into the high 90s and 100s. It was 102 when we left the range this last match on July 23. One of the guys said that even the bugs knew enough to take shelter. I quipped, “you mean to say we’s dumber than bugs?” “That’s exactly what he’s saying,” said another. Most of those competing are former or currently serving military. I’m probably the only one who shows up regularly that doesn’t have any military background. I’m not even a club member, but the guys who run it have no problem with that. I think that technically you have to be a member or a guest of a member, and there are usually enough members to offset non-members so that it makes no difference. And even if there are times when that’s not the case, no one cares. They are much more laid back than, for example, most high power matches. We had one guy last year who made some comment about some of us ‘having a party’ when we were making too much noise for him. He hasn’t been back, and we’ve made a joke of the comment ever since. The decidedly military makeup of the group makes for some serious shooters, but we really are there just for the fun of it. We have maybe three official CMP matches a year, and we are even a little bit lax on the rules for those (though not too much, as we do want them to be official). And many of the participants also go to an annual match at Butner. I haven’t been to Butner, yet, but I suspect that’s where you may see a little more seriousness. I’ve been going almost every month for the past year and half with a friend of mine from church who used to shoot black powder competitions there years ago. When I first started shooting the match, I was barely hitting paper with my M1 Garand. If five out of 10 of my shots even scored, I considered it a good string. But I was just a beginner at the time. So I kept at it. And that’s key for anyone getting into this. Keep at it. Don’t get discouraged. Especially with modern firearms, it’s probably 90-95% mechanics. Learn the mechanics, and you will score well, eventually. Practice, practice, practice. With these vintage rifles it can be a bit different. Due to the wear of age and/or heavy use, it can take time “get to know” your rifle, so to speak. And sometimes, there’s just no decent rifling left in the barrel and there’s no way to shoot it consistently without replacing the barrel. Targets are at 200 yards. I don’t know the exact size of the targets, but I think they are official CMP 5-foot targets, with scoring rings of 5, 6, 7, 8, 9, 10, and X, with the inner 9, 10, X rings being black and the outer rings being white. Each match consist of three strings of 10 rounds each, or 30 rounds per match. There are two matches on each match day. You can switch rifles between matches and there’s a 10 minute ‘sighting rounds’ string for those who want to zero their rifles. Assuming 10 sighters per match, that comes to 80 rounds for the day. Both matches start with a slow-fire (10 rounds, 10 minutes) prone and end with slow-fire off-hand (standing). The first match, second string is rapid fire (10 rounds in 90 seconds) prone and the second match, second string is rapid fire, sitting or kneeling (your choice). Most of the participants shoot custom loaded ammo, some of them even casting the lead bullets. I had been shooting mostly surplus stuff, but the last two matches I’ve been pulling apart some ’68 Lake City .30-06 and reloading it with 27.8 grains of SR4759 to reduce the recoil with my Remington M1903A3. It’s made the world of difference for me. Turns out that even though the recoil doesn’t bother me, per se, it was throwing me off quite a bit. This last match I shot a personal best of 241 in the second match. With the reduced recoil, I can now focus on the mechanics without the distraction of the recoil. As I improve on my score consistently, I can work my way back up to full loads. Congrats to my buddy, Fran, who won the second match. On one of the strings in that match, he shot all black. The long time participants couldn’t remember the last time anyone did that at the VMR match. Fran used to win black powder matches all the time, and I think he said he has shot 1000yd matches, too. But part of the challenge has been getting used to the fact that with these old rifles, shooting a four inch group is actually acceptable. All in all, it was a fun day. Probably the most fun I’ve had at this match, yet, given I’m finally figuring out some of the mistakes I’ve been making and I’m seeing marked improvement. I don’t doubt that I could probably benefit from an Appleseed shoot, but I’m kind of liking this way of learning. I’ve gotten to know the folks who attend these matches regularly and many of them are more than willing to help me improve my shooting.